Integrated expansion board cap waterstop systems are designed to replace post-applied joint sealant, and provide a fluid-tight internal seal like a traditional waterstop with a one-step, integrated unit. 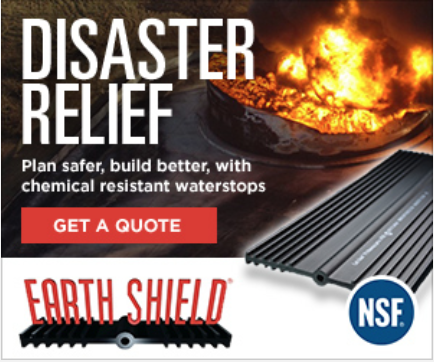 Earth Shield expansion board cap waterstop is installed on top of conventional expansion board filler or Earth Shield’s own chemical resistant, plastic expansion board. The expansion board acts as the form; therefore, no form splitting is necessary. This greatly accelerates the project schedule and provides a long lasting, attractive finished concrete joint. Earth Shield screed key cap slides over the top of metal screed key, eliminating the need for sealant. 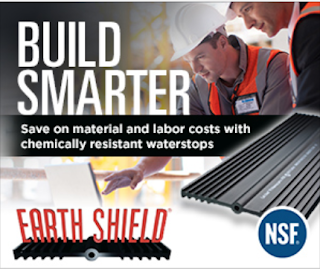 Like all our thermoplastic vulcanizate waterstops, Earth Shield integrated cap system waterstop can be heat-welded using a standard waterstop splicing iron. This allows for easy field fabrications, and allows the waterstop to function as a continuous, homogeneous, fluid-tight diaphragm. Waterstop change of directions can be purchased along with straight roll stock, and custom, fit-to-print waterstop modules are produced to order. Prefabricated ells, tees, tank pads, column fittings, and many others are in stock and ready to ship. Protect waterstop from damage during progress of work. Clean concrete joint after first pour to remove debris and dirt. Prior to placement of concrete notify engineer for field inspection approval. 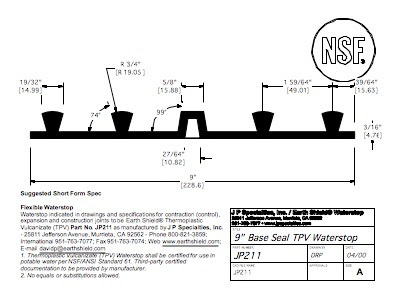 Inspect waterstop and field splices for defects. Upon inspection of waterstop installation, replace any damaged or unacceptable waterstop and dispose of defective material. Place the JP EBCapstop over the top of the expansion board. Securely fasten the JP EBCapstop the expansion board so that the JP EBCapstop is flat against the header board. Any kinks in the JP EBCapstop should be straightened out before it is fastened to the header board. The JP EBCapstop should be mechanically fastened (nails or staples) below the flange. The fastening devices should be placed every 6" to 12" on center to maintain the alignment of the JP EBCapstop along the header board. For the best protection against liquid penetration, care should be taken to not tear or puncture the JP EBCapstop above the flange. Pour the concrete and screed to the top of the JP EBCapstop. It is imperative that the concrete totally encapsulates the flange in order to eliminate any voids or honeycombing below the flange and to form a liquid tight barrier. Care should be taken if the concrete is vibrated or rodded to avoid damaging the JP EBCapstop. The concrete should be vibrated, or thoroughly rodded, near the joints to insure proper consolidation around and under the flanges. It is imperative that the concrete not be subjected to loads until it has reached the rated strength per the design requirements (minimum 3,000-psi). When pouring concrete in a checkerboard pattern the exposed edge of the expansion board must be protected from traffic and abuse. Driving over exposed header boards will initiate cracking. i.e. It is not good practice to drive over the header board onto or off of the poured slab. Doing so may cause cracking, even if the concrete has reached its design strength (3,000-psi minimum). Loads that exceed the rated strength of the concrete shall not be allowed. If cranes are to be used for tilt-up construction, the weight of the crane must be considered in the concrete strength specification. For welding, fabrication, placement, execution, and quality assurance please follow all procedures stated in Earth Shield Master Specification Section 03250. 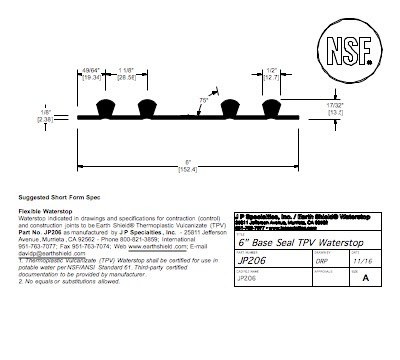 Base seal waterstop is ideal for flat pavement jobs such as runways, large containment slabs, etc. Base seal waterstop is by far the easiest waterstop to install... Simply lay the waterstop directly on the compacted sub-grade, place and finish concrete, and create control joint using saw cut or other method. The base seal provides a permanent, life-of-structure seal at the bottom of the joint. Base seal is suitable for construction, contraction (control), and expansion joints. Base seal should not be used on jobs that make interior wall transitions as the part is non-symmetrical and therefore cannot function correctly. For large hydrostatic head pressures (>50 foot) ribbed centerbulb should be used instead.